Read until the end for your chance to win a month’s membership and lunch for 2 people! 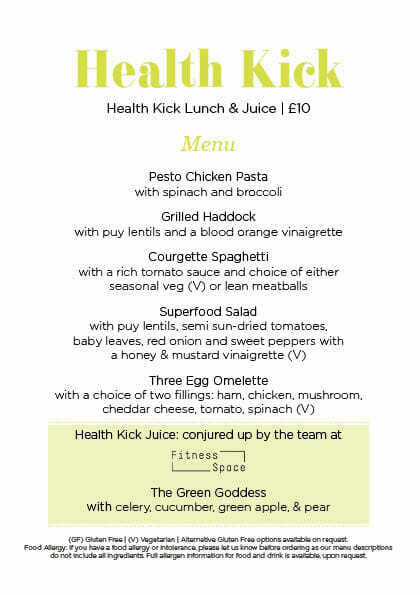 It’s not easy, this healthy eating gig… especially when there are so many fabulous places to eat in Belfast all with such delicious, delectable, (I’m drooling) dishes on the menus. But believe it or not, eating healthily, eating well and eating delicious food in restaurants nowadays is completely achievable…and enjoyable! If you’re like a lot of people, you love the starters selection on a menu more than the main courses and quite often these include lovely healthy options and of slightly smaller portions! Order a couple of healthy starters instead of a heavy main. Who doesn’t love a little selection of food anyway! You can be tricked into thinking salads are always healthy but with too much sauce, they can be just as calorific as some of the big players. We all know we should ask for the sauce on the side on our health kick, but often we end up drowning our salad with it anyway! Try the fork dip trick – simply take your fork, dip it into the side sauce and then eat your food. You’ll still have the lovely taste accompaniment without the overload. 4. Let the health kick beGin! It’s all about our choices at the end of the day. A lovely lunch or dinner out with friends doesn’t mean you have to sit there with a pint of water. A refreshing vodka & soda or gin & slimline tonic come in under 100 calories! No guilt here! The Chelsea have over 20 varieties of gin – check out their signature gin serves and guest gins on their list! We love the Monkey 47 Signature Serve: Strawberry, Grapefruit & Fentimans Light Tonic. 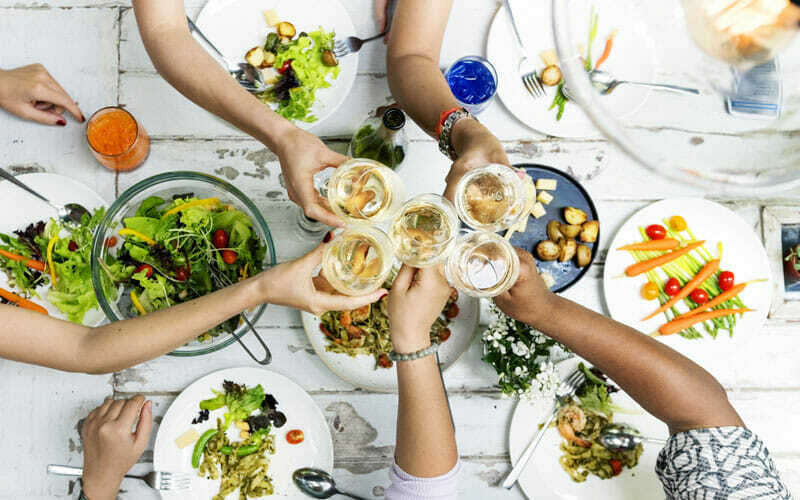 Your whole group may not be just as motivated as you or on the same health kick so a great tip is to order before anyone else. This means less temptation to order anything triple cooked or covered in cheese when your friend down the table does! Order your delicious superfood salad or tasty chicken and vegetable dish and sit back knowing you’re happy with your choice… and try your best to only steal one or two chips maximum from your companion! The most important tip is ENJOY your food and dining experience. There is no point in eating things you don’t enjoy as this is not a sustainable lifestyle, and life’s too short! As mentioned before, it’s all about choices and moderation. Nobody is telling you to go to a restaurant and order lettuce leaves – just not lettuce leaves deep fried with cheese with a side of triple cooked chips truffle oil chips. … and remember, a cheat here or there won’t hurt anyone. You know in yourself what you can allow now and again! Just keep your goals in mind and remember to keep enjoying it. 8. EAT TOGETHER, TRAIN TOGETHER. It’s hard to stay on track on your own. Encourage friends to join you on your healthy journey – motivate each other, dine out together and train together! We at Fitness Space have just opened up our first Northern Ireland Studio right beside The Chelsea on the Lisburn Road and we would be delighted to welcome you for a complimentary Discovery Session. This is a 1 on 1 with one of our personal trainers who will carry out a body composition analysis and advise you on a plan to achieve your goals including nutritional advice and a professionally created home workout. Simply quote ‘The Chelsea’ when enquiring for your complimentary Discovery Session. Members at Fitness Space never train alone. In addition to studio access you are assigned their own Fitness Coach – with you regularly face-to-face, and daily via our personalised app. We’re always by your side. We’re in it for your journey. It’s what sets us apart from the rest. Our studio classes include Kettlebells, Hot Yoga, HIIT, Row45, Hot Bike, Bells, Bags and Ropes, Ride and Lift, Connect Bike, and our signature early morning Fit Camp. For more information visit – www.fitnessspace.com/lisburnroad or call 028 9592 5000. 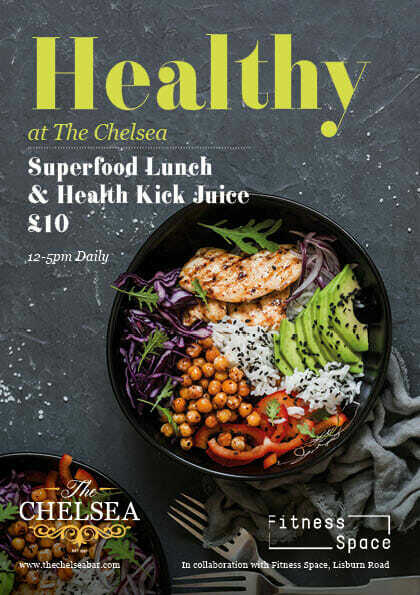 Enter your details below to win a free months membership for 2 people and lunch for 2 in The Chelsea. Winners will be announced Friday 2nd February!